Hello everyone! The weekend is almost here! Ugh! Thursday. I can do this! I really did not want to get up this morning. But here I am! Just need to keep moving - lol! Today is a new Thursday challenge at Create with Connie and Mary. This week is we have a sketch to work with. Take a look! A fun and simple one! I had lots of ideas in my head but these little critters were calling out to me. These little guys are just so adorable! 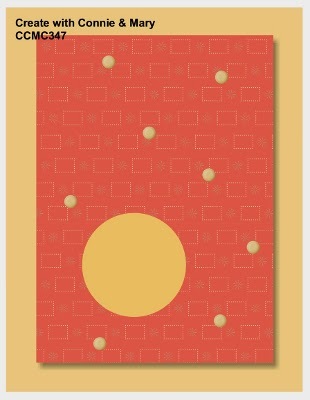 As I look at this card now, I think this would have made a cut Easter card! Hmm... Might have to try this one again! Be sure to check out the cards from the design team at Create with Connie and Mary! Lots of inspiration there! Thanks for stopping by and have a super day! SUPER cute! I love the addition of the grass along the bottom! It must have been something with Thursday, cause I had the same problem! lol! Thanks for playing along with the sketch challenge...great job! Wow, Deb, this is completely adorable! The fun bunny peeking out from the grass is super and I love that you made the shape an oval instead of a circle....it's kind of a nod to Easter, even though technically this is not an Easter card! This card is absolutely delightful! It is fun to look at, with great colors and great shapes. I love that you used the bunny for a sentiment other than Happy Easter - we can use that bunny past April 5!! Thanks for playing along! Love this cute card! Really like the fringed grass and the silver star on the sentiment. Thanks for playing the sketch challenge and Create with Connie and Mary! Oh my word is this ever DARLING!!! LOVE the bunny (of course) and the oval is the perfect shape! Thanks for playing along this week in the Create with Connie and Mary Thursday Challenge! Hi, Deb! I love how you used this sketch and the oval frame for the bunny! The colors you used are so sweet and the star background is a wonderful touch! Thanks for joining us this week for the Create with Connie and Mary color challenge! 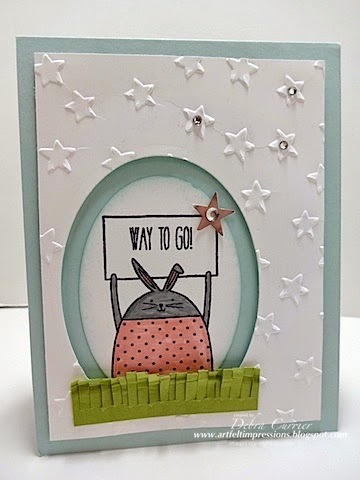 I love how you set the bunny in the oval and bordered with fringed grass; super cute! Thanks for joining us for the Create with Connie and Mary colour challenge!